Engineering notation is a version of scientific notation that uses powers of 10 that can be divisible by 3 such as 10^3, 10^6, 10^9, and 10^12. Numbers expressed in engineering notation are always stated in thousands, millions, billions, trillions and so on. For example, 12,345,00 would be expressed as 12.345 × 10^6 (read as 12.345 million). Because the number has 8 digits, the decimal point can only be moved by 6 places to the left. If the number was 123,450,000 it would be expressed as 1.2345 × 10^9. 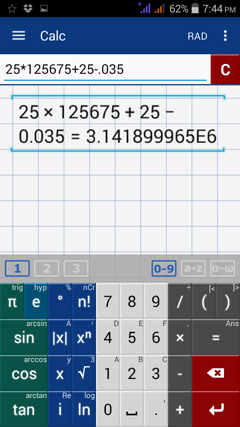 To express results in engineering notation, tap the menu button and select Settings > Calc > Number format > Engineering in order. Perform the indicated operations. Express the results in engineering notation. 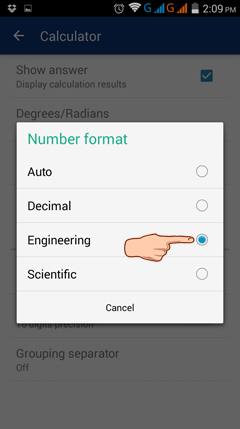 Switch to engineering notation by tapping the menu button and selecting Settings > Calc > Number format > Engineering in order.